Rasul “Rocky” Clark died at just after 6 p.m. Thursday following complications from abdominal surgery. Rocky Clark was nearly totally paralyzed playing high school football during the fall of 2000. He was a 16-year-old backup running back on September 15, 2000. Eisenhower’s starting running back had just separated his shoulder in a game at Oak Forest High School. Rasul Clark went into the game. Four plays later, he was tackled and suffered two broken vertebrae in his neck and a spinal injury. Since Rocky’s injury, a following of thousands of well-wishers, supporters came to his side. 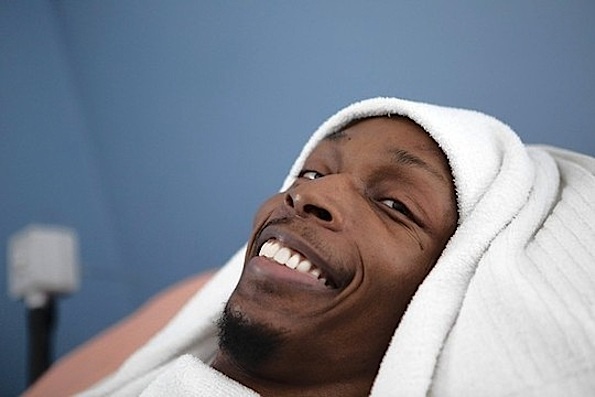 His friends point to his remarkable ever-present smile and faithfulness despite poverty and personal pain as a trademark of Rocky’s pride in his character. According to Dr. Don Grossnickle, a Deacon at Our Lady of Wayside Church, “Rocky Clark was ever a proud man. He was a proud athlete, a lover of football. Eisenhower High School never forgot him and worked to assure him of their devotion to him. Rocky became a voluntary coach and role model. Rocky Clark taught the world many lessons in his twelve years of enduring what the media called: “a fate worse than death”. Rocky’s mother, Annette, never left his side and together with the love and support of others, proudly faced whatever the world gave them. Tough times persisted, but many lifted their spirits by an encouraging word, donation, and expressions of solidarity. fought to be dignified in his faith, and his acceptance and dedication to make something positive happen because of his injury, He never gave in to self-pity. In August 2010, Clark was informed by his insurance agency Health Special Risk Inc. that his $5 million health insurance had reached its maximum and would no longer cover his medical care. Rocky became friends with Rob Komosa, an athlete who was paralyzed in football practice at Rolling Meadows High School about one year before Rocky in 1999. Komosa, himself at high risk from complications of his injuries, has witnessed the complications-related death of another paralyzed athlete — Travis Hearn. The Rock Island High School athlete was paralyzed in a collision at a high school game in 2006. Hearn died in 2008 from complications involving his lungs. Komosa once helped raise $10,000 for Hearn’s specialized van. What an “INSPIRATIONAL” young man! You are my hero! RIP- your burden is now light and your wings have taken flight! It’s amazing how a perfect stranger can touch such a special place in the hearts of so many people. Rocky, your story of tremendous strength and the will to fight will forever be with us. To the family of Rocky, I pray for brighter days ahead for you all, for comfort & for healing and I want to thank for sharing such a difficult and inspiring journey with the rest of the world. May God bless and may Rocky rest peacefully. RIP Rocky. I hope that you are up in heaven playing football and pain free once again! Rocky became co-founder (with Grossnickle) of the Gridiron Alliance — an organization founded to help improve the lives of athletes who have been seriously injured or paralyzed playing school sports and to establish an improved standard of school sport safety to help prevent such injuries from occurring in the future. Rocky Clark visited Soldier Field many times asking friends to join him in looking out for other paralyzed student athletes who need the love and support of Chicagoland. He experienced the compassion and power of the Chicago Bears organization — meeting Virginia McCaskey and Bears players that he so loved and admired. Brian Urlacher raised funds for Rocky’s specialized van. Devin Hester also provided support. Chicago Bears Vice President of Business Administration, John Bostrom became a close friend and offered support from the Chicago Bears organization. we have fallen hopes and shattered dreams. if we did not have hope again? with nothing to look forward to. if we did not dream? without a goal to reach. Life does not always give us what we expect. there’s a rising miracle waiting for us to behold. Stay STRONG! Another day, another chance! Through the assistance of Chicago Bears Director of Community Relations Caroline Schrenker, who arranged for Rocky to come to Bears games, Rocky told folks about his wishes to help other paralyzed student athletes. Rocky also made friends with Marc Giangreco, Ravi Bachwal, Dan Jiggers, Rob Johnson — loyal friends who never forgot his ongoing story and struggle. lived in the tradition of Walter Payton, whose family never forgot him. Now, we celebrate the gifts that rocky Clark gave to the world. 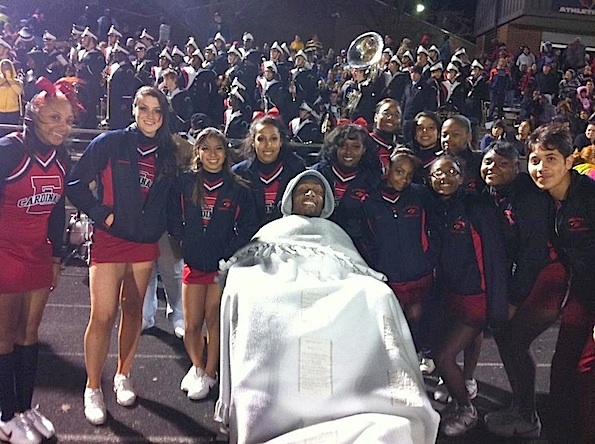 Rasul “Rocky” Clark with Eisenhower Cardinals cheerleaders and band. (Facebook page).